Thanks for stopping by to learn more out about Crazy Amy! 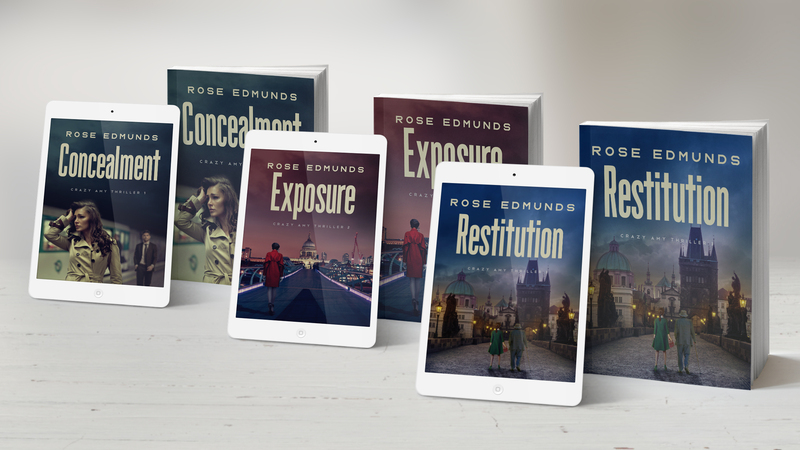 If you’ve got here via one of my ads and you’re desperate to start reading at the beginning of the series, simply click the link below to check out Book 1 CONCEALMENT. For a limited time, it’s just £1.99/$2.99 or free with Kindle Unlimited. But if you have a couple of minutes, I’d love to tell you more about Amy and the books. At the outset, Amy is at the top of her game in a high-flying job. But her “perfect” life implodes when a colleague is murdered and she suspects her bullying boss is implicated. Forced to investigate to save her own skin, she’s pitched into a nightmare that will change her life forever. As the series progresses, she confronts some painful truths not only about herself, but the corruption and hypocrisy rife in the business world. It’s fair to say that Amy is unlike any other amateur sleuth. So if you’re fed up of the same old hackneyed plots and characters in thrillers, these may just be what you’re looking for. Read on to find out more. HOW IS CRAZY AMY DIFFERENT FROM OTHER WOMEN SLEUTHS? For a start, Amy’s childhood was unusual and traumatic. I won’t say more here because it’s a mystery that’s unravelled in the series starter Concealment. But the toxic legacy of the past, and her desire to keep it secret, drive many of her actions. If you really want to know what her secret is, there’s a blog post about it on this site, but I’m not posting a link – you’ll have to find it! As Amy’s mental health deteriorates during the course of Concealment, she is haunted and taunted by a hallucination of her fourteen-year-old self. Little Amy has proved to be a star of the series in her own right, with many readers finding her a compelling character. Lest you should feel too much sympathy for adult Amy, I should point out that she is a polarizing figure. She drinks too much and despite her deep insecurities, can be arrogant and unkind to others. Bestthrillers.com refer in their review to the “ loathing and vitriol that makes Amy so unique among contemporary sleuths”. Others have described Amy variously as a “remarkable and unusual character”, “a fantastic creation” and “a breath of fresh air from the sanitised female protagonist” One woman even said “surprisingly, Crazy Amy helped me to do with the craziness in my own life.” I must admit this surprised me too, as I find living with Amy in my head mentally exhausting! And for the record, Amy does not like the Crazy Amy label she’s acquired, but at least she recognises that some of her actions may have contributed to the perception of insanity. HOW DID AMY GET INTO SLEUTHING? At the beginning of Concealment, the series starter, Amy seems to have it all—a high-powered job in finance, a fancy home, and a designer wardrobe. Nobody knows of her troubled past and inner struggles, or the Little Amy voice in her head. But when a colleague is murdered and Amy suspects her bullying boss may be implicated, her perfect life implodes. As her boss tries to discredit her, Amy is forced to dig for the truth, even though her past may come back to haunt her. And however her investigations pan out, Amy’s life will never be the same again. HOW DID AMY END UP WITH HER OWN SERIES? Originally, I planned for Concealment to be a stand-alone psychological thriller, with the reader unsure what is real or in Amy’s head. And it can still be read as such. However, fans were keen to see Amy rise from the ashes and take on another investigation. She does this in EXPOSURE, when the suspicious death of an old friend propels her into an undercover investigation that spirals out of control. IS CRAZY AMY BASED ON ROSE? The next Amy adventure will be out in 2019 and I plan further books beyond that – so watch this space! WILL I ENJOY THE BOOKS? To be honest, they are not everyone’s cup of tea. Effectively, they are a unique combination of psychological, amateur sleuth and financial thrillers. So psychological thriller fans may be turned off by the financial aspects of the plots, and financial thriller fans may be overwhelmed by the emotional depth. The only way to find out is to try them and see! If you’ve read this far, thanks for taking the time. The series now has over 150 5* reviews across Amazon and Goodreads, so if you’d like to check out the books on Amazon and see what reviewers have to say, here is a link to the whole trilogy on Amazon. All books are currently just £1.99/$2.99 or free with Kindle Unlimited. They are also available in paperback.